Rich Look Interior is working since last two decades. We are specialized in vintage furniture, custom made interiors and excellent architectural designs with the help of great skills of our craftsmen. With their creativity today, our designs have become our mark of distinction. We are working with best designers, maintaining the highest standards and never compromising on quality. 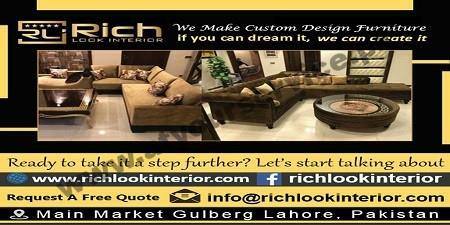 Rich Look Interior uses the foremost techniques to deliver innovative, modern and affordable quality furniture.